Here are two tools I've been using lately to better understand the functionality of my game designs. The first is the loop, a structure that should be very familiar to those who have looked into skill atoms. The second is the arc. The 'game' aspect of this beast we call a computer game always involves 'loops'. Updates their mental model and starts the loop all over again. Or kicks off a new loop. These loops are fractal and occur at multiple levels and frequencies throughout a game. They are almost always exercised multiple times, either within a game or by playing the game multiple times. Interrelated actions that trigger multiple loops in order to bring about specific system dynamics. Systems of crisply defined cause and effect that yield self contained systems of meaning. Functional feedback that helps players understand causation. Loops are very good at building 'wisdom', a holistic understanding of a complex system. The player ends up with a mental model that contains a thousand branches, successes, failures and nuances that lets them approach new situations with confidence. 'Arcs' have similar elements to a loop, but are not built for repeated usage. 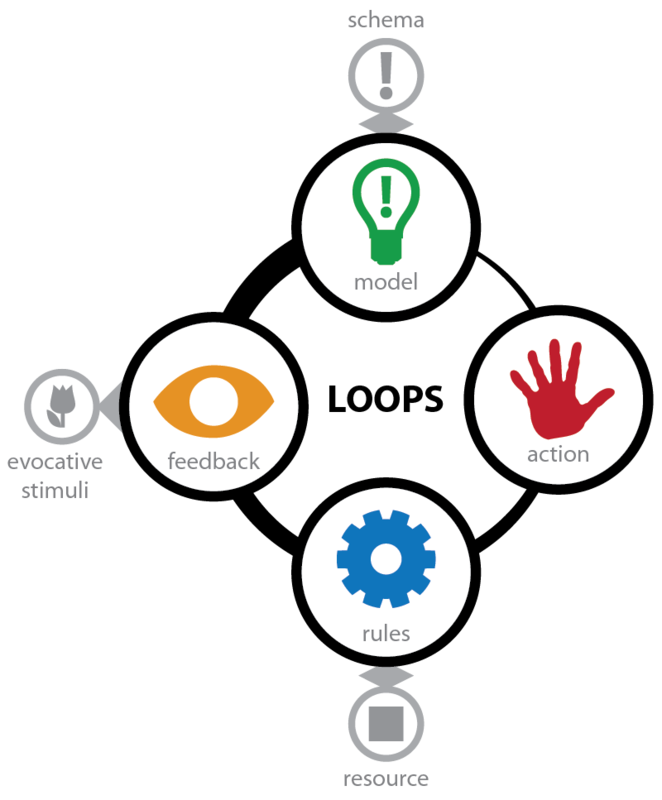 The player still starts with a mental model, they apply an action to a system and receive feedback. This arc of interaction could be reading a book or watching a movie. However, the mental model that is updated rarely results in the player returning to the same interaction. The movie is watched. The book consumed. An arc is a broken loop you exit immediately. Simple systems that rely heavily on complex mental models to have meaning. Text on a page is a good example. Complex evocative feedback that links together existing mental models in some unique, interesting or useful manner. For arcs, the feedback is 99% of the payload and the actions and systems are simply a means to an end. Once this payload is fully delivered, the value of repeated exposure to the arc drops substantially. Arcs are highly efficient at communicating 'success stories', a singular path through a system that someone else previously explored. The best teach a lesson, either informative, positive or negative. This is a brilliant learning shortcut but the acquired knowledge is often quite different and less robust in the face of change than 'wisdom'. With a slight shift in context, the learning becomes no longer directly applicable. It is not an accident that we make the distinction between 'book learning' and 'life experience'. One of the common issues with arcs is that people burn out on them rapidly, rarely desiring to experience them more than once. It is possible to give arcs a bit more staying power by stringing them together serially in a sequence of arcs. This is a pretty proven technique and is at the base of the majority of commercial attempts to give content arcs longer retention. Businesses that rely on a constant sequence of arcs to bring in ongoing revenue often find themselves running along the content treadmill. If you stop producing content, the business fails. Any loop can be superficially described as a series of arcs with one arc for each pass you make through the loop. This is an expanded loop. This is useful for recording a particular play-through, however it tells you little about the possibility space described by the loops. Where loops often describe a statistical spectrum of outcomes, the arc notation describes only a single sample. Since both loops and arcs can be easily nested and connected to one another, in practice you end up with chemistry-like mixtures of the two that can get a bit messy to tease apart. The simplest method of analysis is to ask "What repeats and what does not?" Narrative games are the most common example of mixing loops and arcs. A simple combination might involve layering a segment where the player is engaged with loops with a segments of arcs. This is your typical cutscene-gameplay-cutescene sandwich. Parallel Arcs: You can treat the emotional payload of song as an arc that plays in parallel to the looping gameplay. Levels: The spatial arc of navigating a level provides context for exploring variations on a central gameplay loop. The 'Golden Path' in a single player level is really just another name for an arc. Micro Parallel Arcs: A game like Half Life combines both levels and parallel arcs to deliver snippets of evocative stimuli as you progress through the level. These structures also exist in traditional media. For example, if you look at a traditionally arc-based form such as a book, you find an odd outlier in the form of the Bible. At one level of analysis it can be seen as a story arc that you read through and finish. However, it is embedded in a much larger set of loops we casually refer to as a religion. The game-like loops include everything from worship rituals to the mining of the Bible in order to synthesize weekly sermons. The arc is a central rule book for a larger game consisting primarily of loops. In the past I've discussed criticism as a game that attempts to revisit an arc repeatedly and embellish it with additional meaning. The game is to generate essays superficially based on some piece of existing art. In turn, other players generate additional essays based off the first essays. This acts as both a referee mechanism and judge. Score is accumulated via reference counts and by rising through an organization hierarchy. It is a deliciously political game of wit that is both impenetrable to outsiders and nearly independent of the actual source arcs. Here creating an arc becomes a move in the larger game. Intriguingly, tabletop roleplaying games use a similar core structure though the high level rewards differ. Even in these complex cases, understanding which behavior is a loop and which is an arc helps tease apart the systemic behaviors. Of the two, loops are rarely discussed in any logical fashion. People note the arcs and comment on them at length while being quite blind to the loops driving the outcomes. Both criticism and religions are lovely examples of how loop analysis can provide a practical description of the game's ruleset and magic circle even when the actual players are only vaguely aware of their constraints. In the pre-computer era, games dealt almost entirely with loops. The light arcs that games like Chess or Monopoly contained served the highly functional purpose of triggering a player's mental schema. Once that setup payload was delivered, the games focused almost entirely on loops. One could easily claim that historically the term 'game' was used to describe an entertainment made predominantly of loops. With the advent of computer games, designers started mixing more arcs with their loops. Adventure games, game endings and other narrative elements became more prevalent. There are strong cultural and economic reason why this occurred at this period of time that are not strictly an inherent function of the computer game medium. The primary driver for the proliferation of arc-based games is that they fit nicely into the existing retail business model. Over the past 40-years, the dominant way you made money off media was to sell the customer an arc, be it a book, an album or a movie. Once they had consumed that, you sold them another one. With a large enough portfolio of games (typically managed by a publisher), you'd get a reliable stream of revenue. As is the case with evolutionary systems, certain ill-fitting forms of games were punished financially and thus faded from the market. Assume you tried to build a popular evergreen game. You sell it once and that is the only money you get for the rest of the consumer's life. The retailers didn't want that outcome. Nor did the publishers. They preferred to sell players multiple games a year, year after year. The developers that made games that fit the constraints of this specific market reality flourished with profits from mega hits used to fund future moon launches. Many of the modern game tropes such as beatable games, sequels, game concept conveyable by box covers, etc are a direct result this early retail environment. Again, this is a statistical process, not a conspiracy. Mammals and dinosaurs coexisted for millions of year but the shifting climate ended up being more amendable to one form than the other. During the retail era, evergreen games still existed, but in diminished quantities. Since systems are hard to understand, one popular just-so story that emerged during this period that arc-heavy games are some ideal outcome of new computer technology. This matured into a strange arc-worshipping segment of the population that predicts a technology-driven singularity for games that involves ever richer payloads and an eventual acceptance as an equal of other arc-centric media. Someone like David Cage, maker of Heavy Rain, is a modern example of such ideals. But the roots go back much further to the dreams of early science fiction writers and researchers that had little practical experience with creating games. They sold us a delightful dream for the future of games without understanding the first thing about the actual loop-like nature of games. On reflection, it seems quite false to claim computers enabled arc-heavy gaming. A choose-your-own adventure was technologically feasible a hundred years ago. This suggests that arc-heavy games are not nearly as inevitable as some might imagine. Consider the arcade market with its very different business requirements. The arcade owners, publishers and developers were less interested in selling consumable boxes and more interested in repeat play. This business constraint encouraged the creation of evergreen loop-based games that thrived for decades. The market and the culture hugely shapes the form of the games we make. It is certainly not locked in stone. The market is shifting once again. With in-app purchases, there is a large financial benefit to keeping the player engaged both emotionally and financially for long periods of time. A fit game is one that you play forever all while paying for your hobby. It is not one you beat and cast aside. This suggests that loop-heavy games may be making a comeback. So how do we evolve our designs with the market environment? One exercise I've been performing on various games is identifying loop and arcs in a popular genre and then removing the arcs to see if what is left stands on its own. What I've discovered is that arcs are almost never critical game elements. You can remove them and still have a playable game. Narrative sequences that are not specifically functional feedback that powers the completion of a loop. To take this one step further, remove any elements of a computer game that you can 'beat' or that render the game boring or meaningless upon repeated play. Can you make a wonderful game out of the remaining bones? The vast majority of the time you can. Even deeply arc-heavy graphical adventure games yield procedural hidden object games at their root. Now, you can never get rid of arcs completely, nor would you want to. Loops and arcs are ingredients and the goal is to create a new recipe with different mix rather than unquestioningly recreated the same meal again and again. Both Will Wright and Notch made millions by exploring the loops of player expression. Eve forges forth into new territory with every update by exploring the loops of economics and politics. Star Craft thrives because it taps into the mastery loops at the competitive heart of sports. No one is even talking about the loops inherent in religion, a system that has driven the behavior of humanity for thousands of years. Games of improv or bluffing or charades are all loop-based activities with nearly zero traction in the markets today. These are games that can be played for life. Look for loops and arcs in your game. What is the balance between the two elements in your design? What does your game need? This isn't a black and white situation and I respectfully ask you to avoid couching this in any tired us vs them terminology. There is not one market. You may find that the traditional arc-heavy recipes are exactly what you need. If you are selling to a community whose norms for buying games were set during the retail era, creating a great beatable payload of entertainment may make you a lot of money. Many of the popular indie sales channels remain conservative recreations of markets past. It is a well trodden path. If you are making a more modern evergreen game, consider how loops may result in delivering long term value to the players. Question the forms of a traditional game and ask yourself if they are still valid in today's market. Create a fortified island nation with an ongoing stream of revenue.